Police killed in Philippines: Moro Islamic Liberation Front in bloody firefight with authorities. 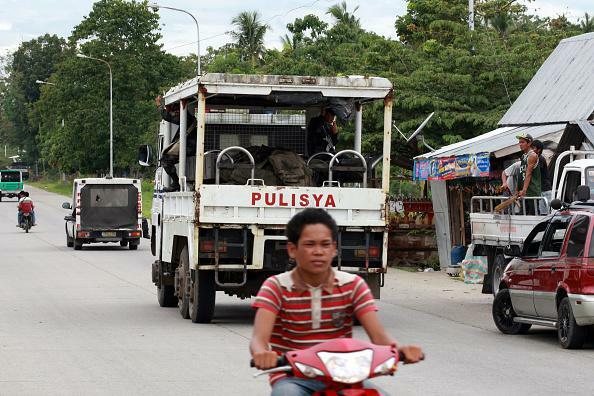 A police vehicle carries the bodies of deceased officers in Mamasapano, Maguindanao province. The Moro Islamic Liberation Front had not been informed of the police operation, which triggered a series of firefights between government forces and rebels, said Mohager Iqbal, a peace negotiator for the rebels. Interior Secretary Mar Roxas called the incident a “misencounter” between government and rebel forces and said the operation would be investigated to determine whether proper procedures were followed to avoid conflict with the rebels under the cease-fire pact. “We are hopeful and confident that this will not derail the peace talks,” he said during a briefing Monday on the incident. Officials said they “believe” Zulkifi was killed in the operation and are conducting DNA tests to confirm his death. According to the FBI, Zulkifi is/was a U.S.-trained engineer who “conducts bomb-making training for terrorist organizations” including the al-Qaida-linked Abu Sayyaf group. In June 2014 the Pentagon said a United States counterterrorism unit based in the Philippines would be “phased out” because of the declining threat posed by terror groups in the region.